ISDA held a market education conference call to explain an initial draft of the ISDA 2013 DF Agreement for Non-U.S. Transactions and Annexes, which is intended to allow market participants to bilaterally enter into selected provisions of the ISDA August 2012 DF Protocol (published on August 13, 2012) and/or the ISDA March 2013 DF Protocol (published on March 22, 2013) that are relevant to transactions that occur at least in part outside of the United States. In July, the CFTC published an “Interpretive Guidance and Policy Statement Regarding Compliance with Certain Swap Regulations” providing guidance as to when the CFTC will assert jurisdiction over swap transactions that have a non-U.S. element. 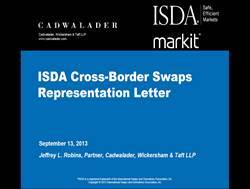 ISDA published a Cross-Border Swaps Representation Letter in August. The letter allows market participants to provide counterparties with status representations needed to determine whether compliance is required. This webinar discusses the contents of the Representation Letter as well as how the Representation Letter will appear on ISDA Amend, featuring Cadwalader, Wickersham & Taft LLP, ISDA and Markit. The CFTC provided interim final rules for swap dealers and major swap participants, extending the compliance date for various External Business Conduct provisions covered by the ISDA August D-F Protocol from January 1, 2013 until May 1, 2013. In addition, the interim final rules extend until July 1, 2013 the compliance dates for Commission regulations related to portfolio reconciliation and swap trading relationship documentation (documentation changes required by these rules will be contained in a second, soon to be published ISDA protocol). We encourage market participants to adhere to the ISDA August D-F Protocol and provide questionnaires to counterparties well in advance of the May 1 compliance deadline. In order to facilitate implementation of Dodd-Frank rulemakings, ISDA is launching a series of protocols starting with the ISDA August 2012 Dodd-Frank Protocol, which is now open for adherence on the Protocols Management section of the website. Legal Memorandum on ISDA DF Protocol and Extension of Compliance Date for EBC Rule. Verify your firrm has adhered on the Protocol Adherence page. ISDA Amend, a joint service provided by Markit and ISDA, enables swap dealers and their clients to amend multiple ISDA Master Agreements easily and efficiently with a single online tool. All aspects of the questionnaire are now available online. Visit Markit’s ISDA Amend webpage. Visit the DTCC’s CICI Utility Portal, and also see their comprehensive FAQ on the topic. Share Dodd-Frank Documentation Initiativeon Facebook. May trigger a new window or tab to open. Share Dodd-Frank Documentation Initiativeon Twitter. May trigger a new window or tab to open. Share Dodd-Frank Documentation Initiativeon LinkedIn. May trigger a new window or tab to open.